Kelp is a type of algae which grows to great heights and resemble a swaying underwater forest of sorts. This highly unique habitat is able to provide food and shelter for hundreds of different species and generally grows quite close to the shore in shallow waters. The forests provide the perfect place for a great variety of plants, animals and fish to thrive, making it one of the most diverse habitats in the world. The strength of the forests is so immense that many creatures are protected within the kelp during even the roughest of storms. The kelp grows closer to the shore as the plants need to photosynthesis. For this reason, you will very rarely find forests at great depths. What is the importance of kelp forests? Everything you come across under the waves serves a purpose. The ocean is a mixture of plants and creatures all on a mission, generally to sustain the oceans health and the lives of those who live within it. Kelp forests are no exception when it comes to preserving the health of the ocean. You can think of any kelp forest as a type of solar city. The sheer immensity of the forest means it is able to absorb plenty of sunlight which in turn makes it a most beautiful home to all types of species. By creating these comfortable habitats, the forests can help keep the various systems in balance. · The kelp purifies the water by getting rid of the waste products produced by the creatures living in the kelp. · Kelp is used for a number of commercial reasons including food production, skin care and even paint. · The entire ecosystem is really productive. All along the shores of Cape Town, submerged deep beneath the waves, lies a hidden world that many a diver has fallen absolutely in love with! Although many kelp forests are located in warmer waters, South Africa’s colder waters have created the perfect underwater landscape for this particular type of ocean plant. This world beneath the water is quite alien like, and a great place to go exploring. 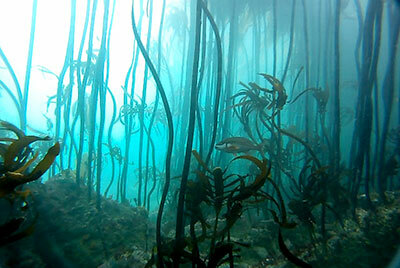 Within South Africa’s kelp forests there are about 14 000 different species. As only about 0.4% of our oceans are protected, the forests and the species living within are actually under threat. Another factor threatening the kelp forests is climate change. As the oceans become warmer, the biodiversity of the forests becomes threatened. Some of the many species that live here and that you will come across when diving in the kelp forests include the seven-gill cow shark and the broad nose seven-gill shark. These sharks are easily recognised and quite social. If you are in search of a real shark diving experience then you might want to book your trip to the Cape kelp forests. New species continue to be discovered in the forests and your best chance to see them is when out diving in Cape Town. Dive the Big 5 has over 20 years of diving experience and offers a unique number of diving packages.